This week’s pre-graduation job fair at the University of California, Berkeley, promises to be upbeat, with scores of recruiters coming to the campus, and a new national survey showing that employers expect to hire 10 percent more college graduates this year than they did in 2011. More than 150 recruiters are headed to UC Berkeley this Wednesday and Thursday (April 18 and 19) for the annual “Just in Time” job fair. The event takes place both days from noon-4 p.m. in the Pauley Ballroom, on the 3rd floor of the Martin Luther King Jr. Student Union building. UC Berkeley’s Career Center, which puts on the campus’s job fairs, among other services, has seen a recent flurry of interest by employers who, encouraged by economic indicators, are moving forward to fill open positions. Even in a struggling economy, “our campus remains a top destination for recruiters because of its world-class academic reputation and students’ hands-on experience,” said Suzanne Helbig, assistant director of the Career Center. At least 1,500 students – garbed in everything from business suits to jeans and T-shirts – are poised to peruse the recruiter booths, distribute resumes and network with representatives from high-tech startups, government agencies and major corporations. Wednesday’s event will focus on engineering and science opportunities, while Thursday’s will feature a broader range of employers, including government agencies and non-profits. 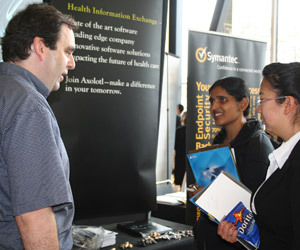 Tech, engineering and digital media recruiters at the job fair will include Cox Digital Solutions, Oracle Corp., Alpine Data Labs, Amax Engineering, Ask.com, Bio-Rad Laboratories, Comcast Silicon Valley Innovation Center, Coupons.com, eBay, Oxygen Cloud Inc., Shutterfly, GTNexus, Ancestry.com, Samsung Information Systems, StumbleUpon, Symantec, and WaPo Labs, a Washington Post digital venture. Meanwhile, students considering careers in government and public service sectors can chat with recruiters from the U.S. Navy and Marine Corps, Public Utilities Commission, the Kern County School District, San Mateo Transit District, NASA Ames Research Center and Consumer Financial Protection Bureau. Entry-level job seekers are advised to take advantage of internships, which employers are using more frequently to screen applicants for permanent positions, Helbig said. The UC Berkeley School of Law has seen “noticeable signs of improvement in the legal jobs market,” said Terrance Galligan, Berkeley Law’s assistant dean of career development. Even in a down economy, he said, job prospects for Berkeley Law graduates have been positive compared to many comparable institutions. That said, Berkeley Law students entering the job market “have had to be more flexible in choosing a geographic or practice area,” he said. Typically at UC Berkeley, two-thirds of graduating seniors enter the workforce, one-quarter pursue graduate studies, and the remainder enter the military, the Peace Corps or take a year off to travel or explore other options. A survey by the Career Center of more than 1,100 UC Berkeley students who graduated in 2011 found that 58 percent of respondents found jobs in business and finance; 15.8 percent in education; 10.1 percent in other industries such as manufacturing, construction and transportation; 8.5 percent in the non-profit sector; and 7.3 percent in the government sector. Of those, 64 percent found jobs in the San Francisco Bay Area. About one-third of respondents began their job searches six months prior to graduating. The recent survey that found that employers this year expect to hire at least 10 percent more new college graduates compared to 2011 was conducted by the National Association of Colleges and Employers.